40k Hobby Blog: What To Do With A 99% Completed Army? I started and shelved this mint colored Necron ages ago. It has sat in a partially completed state a foot away from me for so long it developed a thick coat of dust. 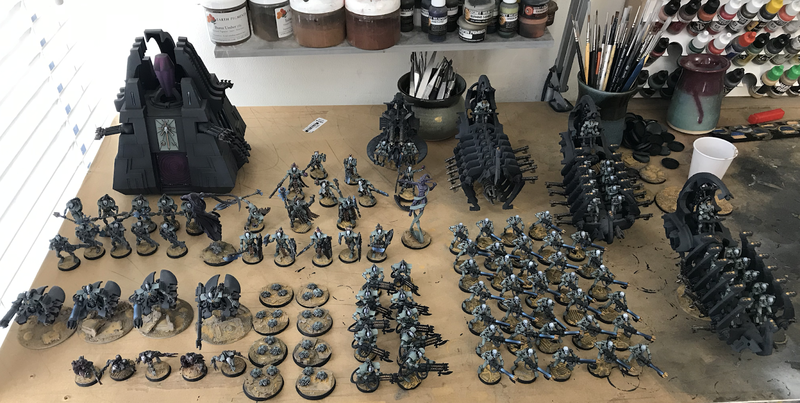 In a spurt of spring cleaning I decided to get the army out and sell it. After looking at it, I decided it needed to at least be based, and have all of the existing units finished. This was fun. It wasn't supposed to be. It was supposed to be a chore that would lead to me being able to get rid of the army easily. What should I do with this force? I know it is not up to my current standards, but I'm kind of fond of looking at it. (probably why I went into Sons of Horus in the first place!) 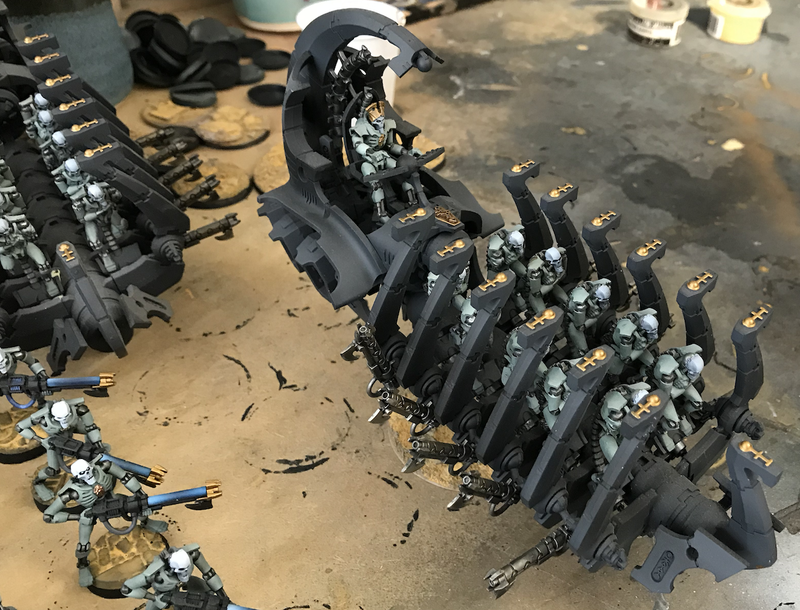 If I decide to sell it, do I need to paint up the remaining kits to round out the force? Do I sell this separately, or as one listing with both painted and NIB kits? I'd sell the NIB stuff as that will probably be fairly easy to offload* and get you some cash and space. Either that or paint it up, as my feeling is most people would want a consistently-painted army. Then you can decide what to do with the painted ones! *Incidentally, I saw you live in DC - I also live in DC and might be interested in some of the NIB figures if you decide to offload. Posting anonymous as I don't have an account and couldn't find your email address. 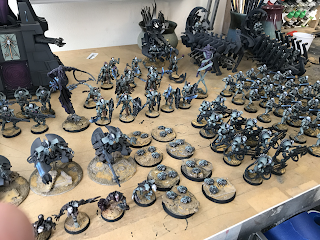 If you want any of the unpainted stuff just let me know. firstname dot lastname at google dot com. Thanks, have emailed you just now! 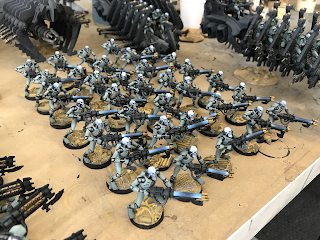 You know where I stand - I'd say sell what's painted as an army, then piecemeal sell off the NIB stuff. 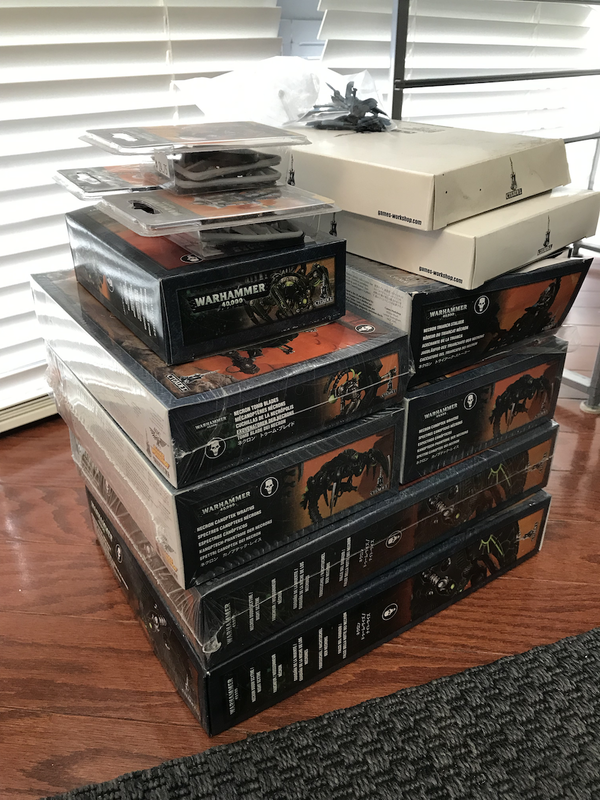 It doesn't sound like you're super enthused about building a bunch of models and painting down to an older standard, I think you'd be happier just moving them out and focusing on new stuff with your current skills in the long run... That said, they look great and I'm sure they'll sell well! Sell it all. 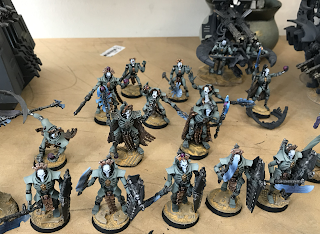 Painted separate from the un-started models, don't bother finishing the bases. What would I do with a 99% finished army ? Celebrate, of course, it'd be the most complete I'd every gotten anything ! 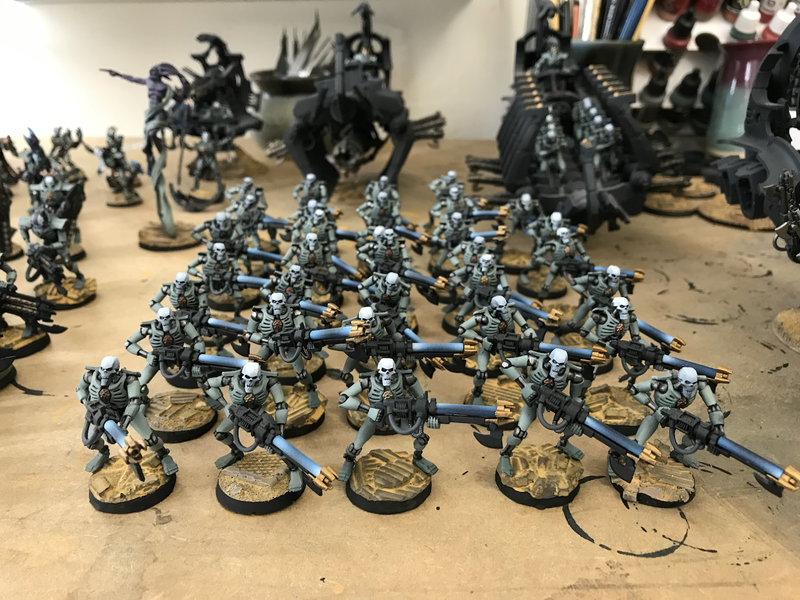 (not really true, the various components of my Eldar army/armies are done). Your comment made me smile! I guess no army is ever finished. That's a great looking army. It might not be up to your current standards, but it would look great on the table. 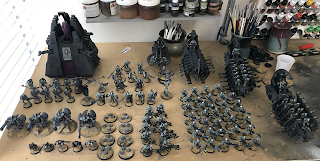 I agree that the army should be sold as a painted army and the NIB boxes as individual offerings. 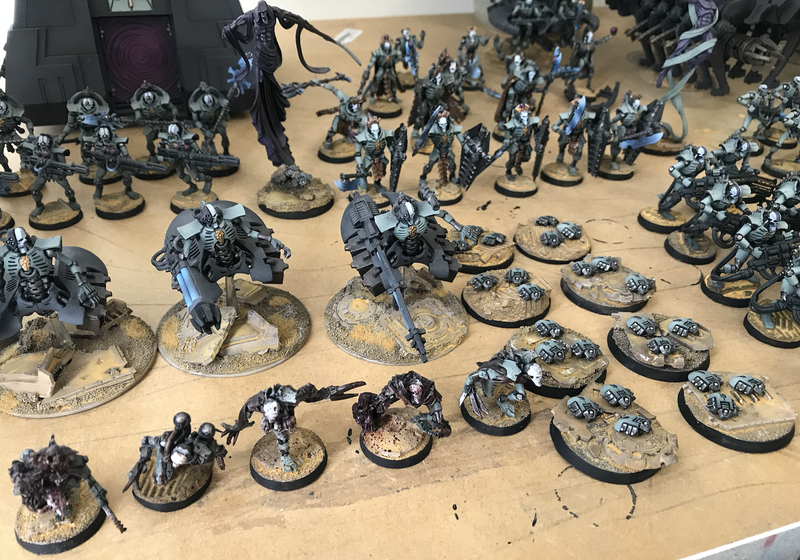 If you do sell the army, consider making a painting guide for the next owner, in case they want to add to it later. Finishing a task is always great. Having a good time while doing it is even better. I'm glad you were able to enjoy the "drudgery". Lastly, I have regretted selling each of my 40k armies I've let go. No advice there, just an observation. I love the painted guide idea! Indeed - people who are looking at buying a completed army and people who are looking for BNIB set are not often the same people. Sell each as they are, separately! 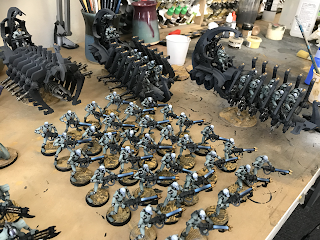 John, as others say - sell NIB kits separately, sell the Painted Army as a completed army and a helpful paint guide for the new owner would be a bonus so they can add at their pleasure - that would be a unique selling point. I like the idea of a guide. That is a really nice touch. Great idea! I agree with the others; sell the NIB stuff and completed stuff separately. I mean, unless you want to keep/use it.